Winemaking: The harvest is done manually. The grapes are sorted out, destemmed and separated from the clusters. This is followed by cold maceration. The alcoholic fermentation takes place in stainless steel fermenters. The lactic acid fermentation takes place in French and Hungarian barrels. Tasting Notes: Wine with ruby red color with purple glow. 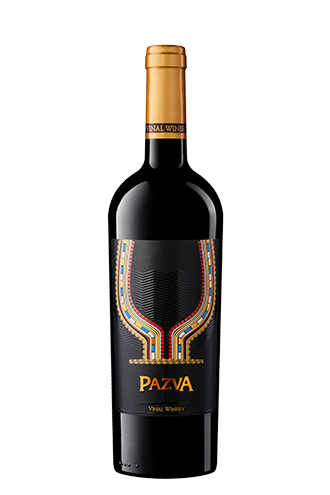 It has an intense flavor of ripe forest fruits, coffee and vanilla as well as a full-bodied taste of black fruits, pepper and oak. The taste leaves a lasting memory. Winemaking: The harvest is done manually. The grapes are stemmed and separated from the clusters. An infusion takes place at low temperature. This is followed by separation of the solid particles and clarification of the grape must. . The alcoholic fermentation takes place in stainless steel fermenters. Tasting Notes: Wine with a golden color with beautiful green nuance. It has a complex and fine flavor with floral notes. The body is harmonious, mild and balanced with a citrus flavor.